This old beige box may not have been the first device to use the term “Personal Computer” but it was the one that cemented the term “PC” in people’s minds, a term we still use today almost 40 years later. 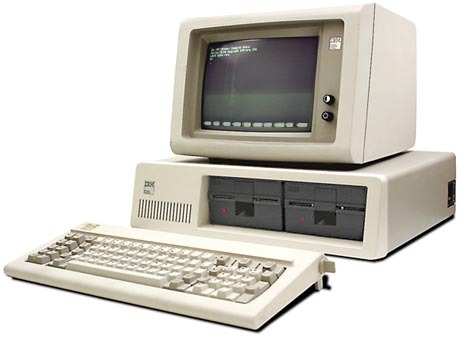 However, you may not realize that for quite some time, the term “personal computer” was in competition with the term “desktop computer.” No one knew which one was really going to win out, until IBM dropped the bomb with its 5150 Personal Computer in 1981. In fact, in the days before laptops, a “desktop” computer seemed like a fable just by itself. The idea that everything you’d need for computing would fit on a desk, and that it wouldn’t be so heavy that it broke the desk, was the stuff of science fiction at one time. Even “microcomputers” of the 1970s often required so many accessories that only the largest and sturdiest desk could contain them. Eventually “Personal Computer” won out as the preferred term, but “desktop” came back as a sort of retronym just a few years later when laptops started coming on the scene, and is still used today. Our friends at Paleofuture have a fun little essay on the term “desk top computer,” tracing it back to 1958 at least in theory, since it was barely even possible to have even a desktop calculator back in those days. It’s pretty clear that if you look at the last 50 years in our lives, that the biggest changes in our society have all been driven by computerization. In 1967, a computer was a large, special-purpose device hidden in an air-conditioned room and staffed by specialists. Today, we are surrounded by computers, so common and so ubiquitous that we don’t even realize they’re part of our home appliances, our communications devices, and even our watches. With such massive changes brought on by computerization in 50 years, especially in the last ten since the introduction of the internet-connected smart phone, just imagine what the next 50 will bring!